I saw this on a group I belong to in Facebook. 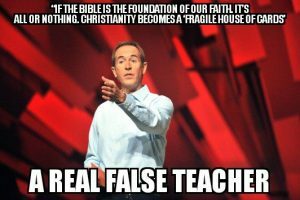 Andy Stanley, the, well, it’s hard to know exactly what he is at North Point Community Church, where he functions as a part-CEO, part-pastor. His sermon series’ in the past have been plagued with issues, much like the quote above, where he seems to want to knock away the barriers for people to become Christians, and instead is knocking free the underpinnings of the Christian faith. This has been going on for a while and it’s no different than much of his previous content. That said, he seems to embrace the “what if” mentality when it comes to these subjects. I wrote an article a while ago about the power of “what if?” in witnessing. I’d link it but I had some database issues a while ago and after recovering much of my site and apparently it has gone away. Much sads. Just to be totally clear here – I 100% understand that he’s addressing the goats rather than the sheep, but to whom is he speaking? Who are the people in his direct audience? These are all likely people who really and truly believe that they ARE ALREADY Christians. As a result, I understand fears addressing this content to believers. To carry this further, “what if” someone who is in the audience is a young Christian and is forced to reconsider their beliefs? As a Calvinist I know that our belief isn’t even our own – we don’t own it, but God provides it to us. As a result there are things that I struggle with on a daily basis and work my way through so I can get a deeper and fuller understand of not only who this God is who saved me from himself because of my nature which claws its way against him in continual revulsion of his power and holiness and glory as rats escape a sinking and burning ship, but also a better understanding of his nature and character in that he knows my form and my weaknesses and yet continues to use me for his glory to help those in my care. So, as someone who is a skeptic at heart, who continually struggles with the “why” questions, this is something that’s good for me. Looking back on my own conversion, I wasn’t entirely sure who Jesus was. I knew that he was the son of God and I knew who God was as my creator, and that my own sins were the reason I stood accused before him. I knew that Jesus took my place and that I was the one who deserved to die, not him. But was I a hard-core 6-day creationist? Nope. Could I clearly articulate the trinity? Nope. Did I have all of the creeds and confessions memorized and was I able to spout them off at a moment’s notice? Not at all. But this isn’t the context of his sermon series – it’s directed at people in the audience – those who largely consider themselves to be Christian. After my conversion I clearly understood that my own concept of who God was and my role in this equation was very foreign to me and that I had to abandon my previously held beliefs to find out not only who God really was, but to understand it on his terms and not my own. 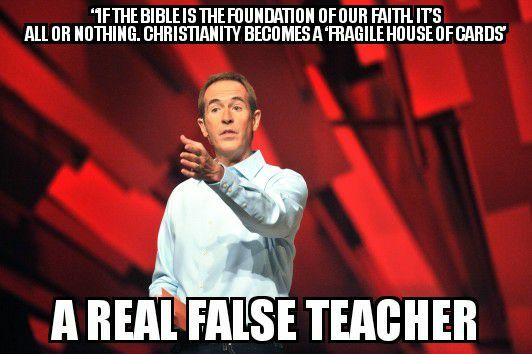 What Andy Stanley is doing is undermining the core tenets of the Christian faith for what he sees as a “mere Christianity” mindset which is fine when witnessing to people to get them beyond their own concepts and to open the door for them to the reality that God exists, but when preached to the people of God, from the pulpit, it tells people that some belief – any belief – as long as it is loosely tied to the God of the Bible is sufficient for Christian faith and practice. This is wholly reprehensible. A Christian immediately upon conversion is not expected to have a full understanding of the triune nature of God, the whole working of God throughout history, and to totally embrace all of these ideas, but in time they do come to that understanding. To have a pastor from the pulpit preach to a community of people who already see themselves as Christians (some may be and some may not), and to teach them that they can abandon anything that seems hard to understand or follow and just to simply cling to the barest of details about Jesus – being told that this is all that’s necessary for a full and deep relationship with God – is one of the most wicked things I can imagine. Look at it this way. When I first met my wife, I had an alright understanding of who she was. I knew that she liked dancing, that she loved 80’s music, and that she looked really great in skirts (BC days). In time I grew to have a much deeper understanding of who she was and, more importantly, why she was the way that she was. I learned and embraced her hopes and dreams. I empathized with her over her fears and failures. I made her own concerns my concerns because of my deep love for her. How? I studied her and I learned from her on her terms and not my own. This is the core of Christian development – to know the God who loves us, and to learn to love him on his terms, not our own. Andy Stanley is teaching people that they don’t need to learn these things and that desiring to grow is not unnecessary, but troublesome. Were I to only know the barest of details about my wife, I’d have no friendship at all, let alone a marriage. Let us take this example from a pastor who is doing a terrible job at leading his flock and let it drive us to know more about our God who loved us by dying for us, and as a result, to learn more about ourselves as we stand before his throne of glory. If, at mid-day, we either look down to the ground, or on the surrounding objects which lie open to our view, we think ourselves endued with a very strong and piercing eyesight; but when we look up to the sun, and gaze at it unveiled, the sight which did excellently well for the earth is instantly so dazzled and confounded by the refulgence, as to oblige us to confess that our acuteness in discerning terrestrial objects is mere dimness when applied to the sun. Thus too, it happens in estimating our spiritual qualities. So long as we do not look beyond the earth, we are quite pleased with our own righteousness, wisdom, and virtue; we address ourselves in the most flattering terms, and seem only less than demigods. But should we once begin to raise our thoughts to God, and reflect what kind of Being he is, and how absolute the perfection of that righteousness, and wisdom, and virtue, to which, as a standard, we are bound to be conformed, what formerly delighted us by its false show of righteousness will become polluted with the greatest iniquity; what strangely imposed upon us under the name of wisdom will disgust by its extreme folly; and what presented the appearance of virtuous energy will be condemned as the most miserable impotence. So far are those qualities in us, which seem most perfect, from corresponding to the divine purity. Calvin, J. (1997). Institutes of the Christian Religion. Book 1, Chapter 1, Section 2. Bellingham, WA: Logos Bible Software. You don’t need to go to India or Iraq or Morocco to serve Christ. Serve Him in your community. Serve Him in your church. Serve Him in your family. Sometimes the biggest thing is the littlest thing. Just serve Christ. though formerly I was a blasphemer, persecutor, and insolent opponent. But I received mercy because I had acted ignorantly in unbelief, and the grace of our Lord overflowed for me with the faith and love that are in Christ Jesus. The saying is trustworthy and deserving of full acceptance, that Christ Jesus came into the world to save sinners, of whom I am the foremost.